UPDATE: This information is now outdated. View new theaters and opening dates here. 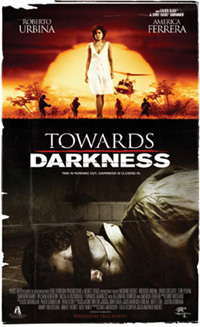 Save the date, book your tickets and plan an awesome night out at the movies on March 14 if you’re in LA, New York, Miami or Fort Lauderdale: Towards Darkness (aka Hacia la Oscuridad) is finally making its public debut. Its also Evan’s first feature as an editor. We went to the premiere last year at the Tribeca Film Festival, which was actually the first time I got to see the film — no sneak previews for me on that one — and I was totally blown away. About a college student’s kidnapping in Columbia, the story is full of suspense. It also stars America Fererra among other talented actors and is half in Spanish, half in English. Evan and I are planning on going to New York to see it, so if you’re going to be around, let us know and we can all go together. I have no idea how long it will be playing, so try to make it opening weekend, March 14, 2008. And if you can’t make it out to the theater, the DVD is set to come out June 17, 2008.